Stromal Vascular Fraction (as abbreviated as ‘SVF’) is cell complex, which contains fat-derived stem cell. If a plastic surgeon harvest fat from abdomen or thigh, serial washing and enzyme treatment performed to make SVF, which contains adipose-derived stem cells, enthothelial cells, red blood cells, interstitial tissue, other regenerative cells, various growth factors, angiogenesis factors, and several biologic enzymes. 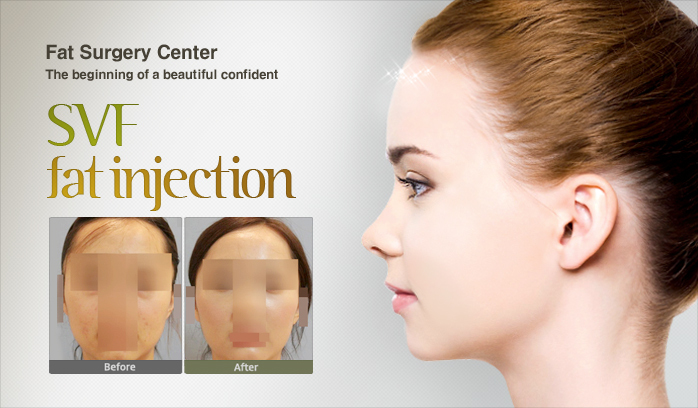 When this SVF is injected during the procedure of micro-fat injection, fat survival rate is increased up to 2 times of conventional method of fat grafting and absorption rate is decreased into half of conventional method of fat injection. This purification of SVF is under the environment of automation in an aseptic room. Firstly, surgeons harvest fat from patient’s donor site and centrifuge the fat, then, 3 fraction of fat tissue components are acquired and divided. After enzymatic degradation and centrifugation for the fat fraction are performed 2 or 3 times, purified SVF is prepared. Total process requires about 1-2 hours for complete separation of SVF containing adipose-derived stem cell. In comparison of simple fat graft or micro-fat injection, micro-fat injection with SVF or so called ‘cell assisted fat injection’, which mean that surgeons inject extracted SVF during the procedure of micro-fat injection, has relatively most higher survival rate of fat. Additionally, there are many reports that there are lots of regeneration of skin and soft tissue. 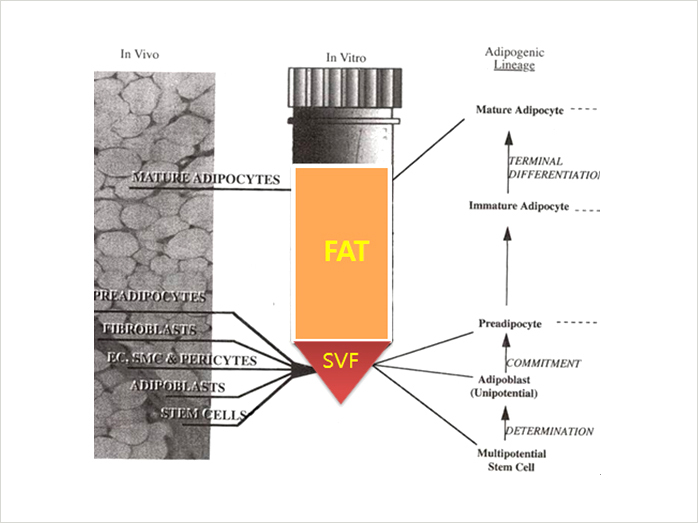 Its superior and aesthetically pleasing result comes from the presence of stem cell in SVF, which makes a complex effect to enhance vascularization and growth of fat cells with interaction among various cells and interstitial tissue improving angiogenesis, growth factors, many kinds of enzyme, and so on. Although the cost seems higher than conventional method of micro-fat injection, if you want more good survival of fat tissue, if your repeated fat injection was not satisfactory for you, we recommend you to undergo ‘SVF micro-fat injection’ for better and satisfactory outcome.